George H. Sheldon is the Acting Assistant Secretary for the Administration for Children and Families (ACF) under the U.S. Department of Health and Human Services. ACF oversees and finances social and economic programs for vulnerable children and families. 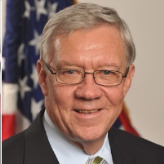 Starting May 16, 2011, he served as Senior Advisor to David Hansell until his departure on June 17, when Sheldon became Principal Deputy Assistant Secretary and Acting Assistant Secretary at ACF. Born in June 1947 in Wildwood, New Jersey, at age seven Sheldon moved to Plant City, Florida, and grew up there. He attended American University and Florida Southern College before earning his B.A. at Florida State University in 1969; he later earned a J.D. from Florida State in 1978. Sheldon began his career in 1967 with the Florida Department of State and then became an aide to Democratic State Senator Reubin Askew. When Askew was elected Governor in 1970, Sheldon helped organize the new administration by running the transition office, and later served as assistant to the Deputy Secretary of the Department of Health and Rehabilitative Services (the forerunner of today’s Department of Children and Families (DCF)) while attending law school. In the early 1970s, Sheldon established in Tampa what became a model drug abuse prevention and treatment program. As executive director in 1971, Sheldon increased by over 400% the services provided by the Hillsborough Association for Retarded Citizens, managing a staff of close to one hundred. From 1975 to 1983, Sheldon served in the Florida House of Representatives as a Democrat, where his key legislative accomplishments included the Nursing Home Reform Act of 1976, which he wrote, and the Community Care for the Elderly Act of 1976, which he co-sponsored. After an unsuccessful 1984 campaign for Congress, Sheldon went back to private law practice, joining the law firm of Levine, Freedman, Hirsch and Levinson in Tampa. In 1987 he established a consulting firm, Sheldon, Cusick and Associates, and successfully lobbied for initial funding of $52 million for computers in the classroom and for increased funding in subsequent years. Sheldon returned to public service in 1999, serving as Deputy Attorney General for Central Florida under Attorney General Bob Butterworth, the same man he would later succeed at DCF. After the 2002 elections, in which Sheldon ran unsuccessfully in the Democratic primary for Florida Attorney General and Republican Jeb Bush was elected Governor, Sheldon left government. From August 2003 to January 2007, he was Associate Dean for Student and Alumni Services at St. Thomas University School of Law in Miami. Sheldon began his tenure with DCF in February 2007, serving as assistant secretary for operations until August 2008, and then as Secretary of DCF until May 2011. He was appointed to both posts by Governor Charlie Crist, a moderate Republican against whom in 2000 Sheldon had run unsuccessfully for state education commissioner. In a harsh campaign, Crist briefly ran a TV spot attacking Sheldon for a 1984 DUI arrest and his earlier support of a bill to keep first-time marijuana offenders out of jail. Crist quickly pulled the ad, however, which coincided with the surfacing of George W. Bush’s 1976 DUI in Maine. During his time at DCF, Sheldon opposed Florida’s legislative ban on gay adoption, which was overturned in 2010. The agency saw a 36% reduction in children in out-of-home care, and Florida achieved the nation’s highest rate of adoptions among foster children for two years. A lifelong Democrat, Sheldon has contributed $10,339 to Democratic candidates and causes since 1990, including $500 to the Democratic National Committee, $1,000 to Bill Clinton’s 1992 presidential campaign, $1,500 to Clinton’s 1996 re-election campaign, $1,000 to Robert Wexler’s 1996 Congressional campaign, and $1,500 to Bill Nelson’s successful 1996 Senate campaign.